Serving the community for over 11 years... Mutley's Hangar - Your flight sim haven! Our industry-leading product reviews are the most respected, the most read, and the most trusted by the flight sim community world-wide. We have a regular publishing schedule with reviews being written by flight simmers who are very experienced and very enthusiastic within their areas of interest. They always thoroughly research their products to offer an un-biased, informative and entertaining review which will give prospective purchasers an insight to the product. We know there is no such thing as a perfect piece of software, be it for a programming or an aesthetic reason. Our reviewers are free from any commercial or editorial pressures so they write an honest, no-holds-barred review. However, we are sensitive to the fact that our opinions could adversly affect the commercial viability of a product for the developers, so we are careful not to criticise just for the sake of it. The review crew is managed by our Managing Reviews Editor who ensures the writing is of the highest standard of grammar and spelling, as well as contributing reviews himself. If you are a developer, large or small, and would like us to appraise your product then please contact me via the link above. The aim of our review writing is, fundamentally, to inform. This is twofold, for it is not justabout providing our objective assessment of a product for other potential buyers, but to also provide objective, clear, and constructive comment for the developers. Under 7.5: No award or recommendation offerred. 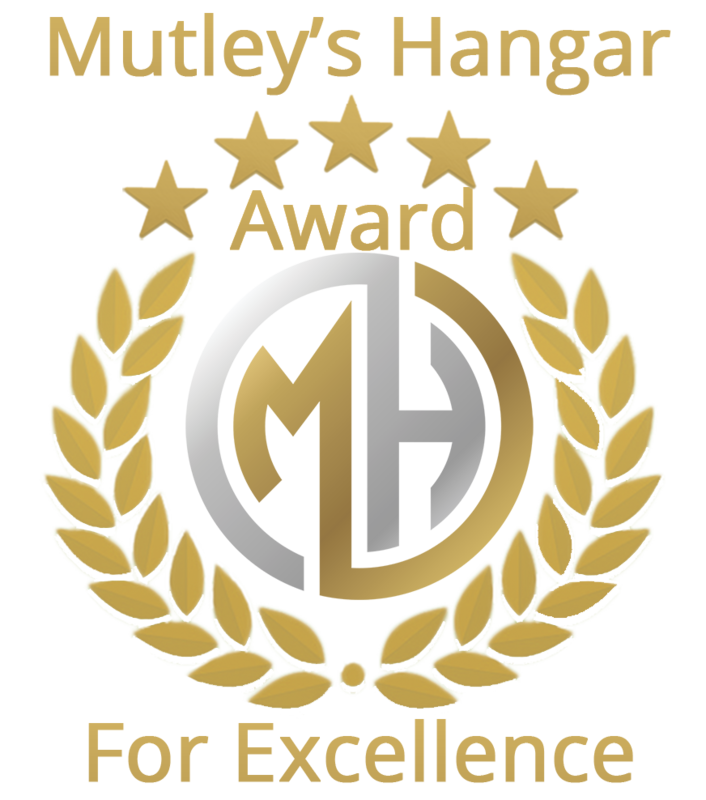 When a product impresses one of our reviewers for innovation, quality, range of features, value for money or accuracy etc., we like to raise its awareness to our viewers by awarding it the Mutley's Hangar Award for Excellence. 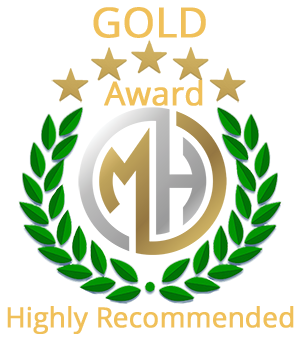 This award is much sought after by developers who are proud to display the badge in their product information. This is still an exclusive club even though the award has been active for nearly 7 years! See below for our wall of fame! You can sort and filter by Developer, Title, Author, Simulator, and Date. Hint: Use the up/down arrows to sort alphabetically or use the filter drop-downs to filter rows, e.g. by Developer or Title. Here are comments from some the industry's most influential people. There is not one single magazine or site I trust 101% in reviews, except one. Mutley's Hangar. I've never seen any review there I could not agree with. Mutley's Hangar continues to grow in to one of the best independent websites dedicated to flight simulation. With well written reviews that are easy to digest as they are informative, Flight1 heartily support them in all that they offer the community. Orbx is always thrilled when we hear of a review of our products at Mutley's Hangar. The quality of the writing is excellent and impartial, the site easy to navigate, and their reputation for quality FS news and reviews is growing from month to month. We encourage everyone to bookmark the site to get great information on add-ons before making a purchase. Mutley's Hangar website continues to grow into one of the most reliable and interesting FS review websites. Mutley's Hangar has for some time now produced consistently well written and in-depth reviews and news about the flight simulator world with an independence and reliability which is now quite rare. We have never been pressured into any commercial liason and we are reassured to know that opinions and views expressed on your website are driven by a desire for good journalism and intelligent thinking. The reviews on this website are the personal opinions of the writers, provided as a free service to the flight simulation community. All our review writers are knowledgeable flight simulation enthusiasts who give their opinion of the products under discussion as encountered in their own flight simulation environment and as perceived in the light of their knowledge and experience. Readers may access these reviews freely but must remain aware that a reviewer's opinions may be rendered null and void in the context of the reader's own computer system, add-on hardware, flight simming environment, or level of flight simming expertise. Furthermore, whilst all reviews on this site are written in good faith, they may possibly contain errors or omissions — the reader must interpret and evaluate the applicability of each review to their own circumstances, and it is the reader's sole responsibility to take whatsoever actions they consider appropriate, or none. The material on this website is copyright and may not be reproduced, reprinted, or published in any form without the written consent of the site owner. Use of this website is permitted only whilst this disclaimer is accepted.